I love the angle that New England Home approached in their "Two of a Kind" article on design duo Jim Gauthier and Susan Stacy. 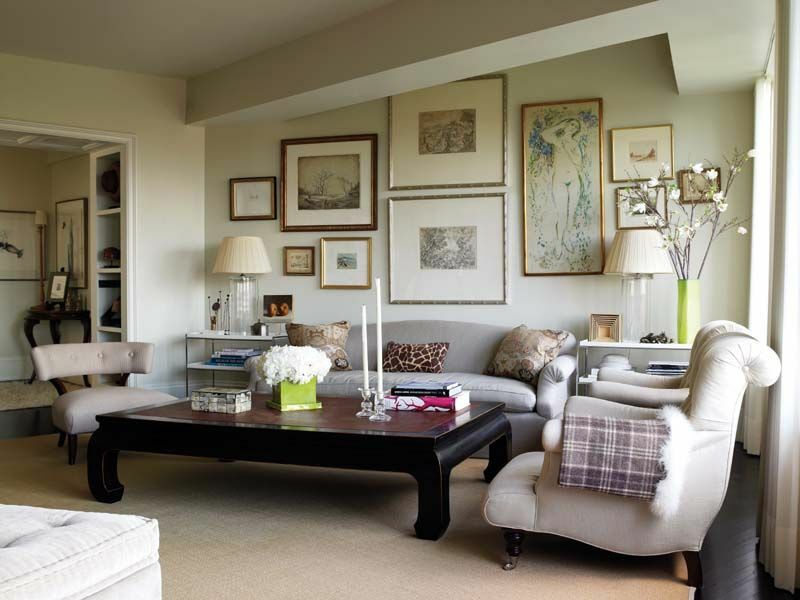 The partnership between Gauthier-Stacy formed in 1996 and happens to be a high-end design firm based out of Boston. What I love about the article is that it shows that obviously they can work well together but still have very different preferences and style as observed in both of their own homes. There are things that I love both of these spaces. How about the bold black and white chairs with splashes of orange in Gauthier's home and that custom whimsical light fixture over the dining table in Stacy's home is killing me. Anyway to read the article go here and to see more of their work go here. P.S. - I first found the link to New England Homes over here. ...one of my favorite home decor & design blogs. 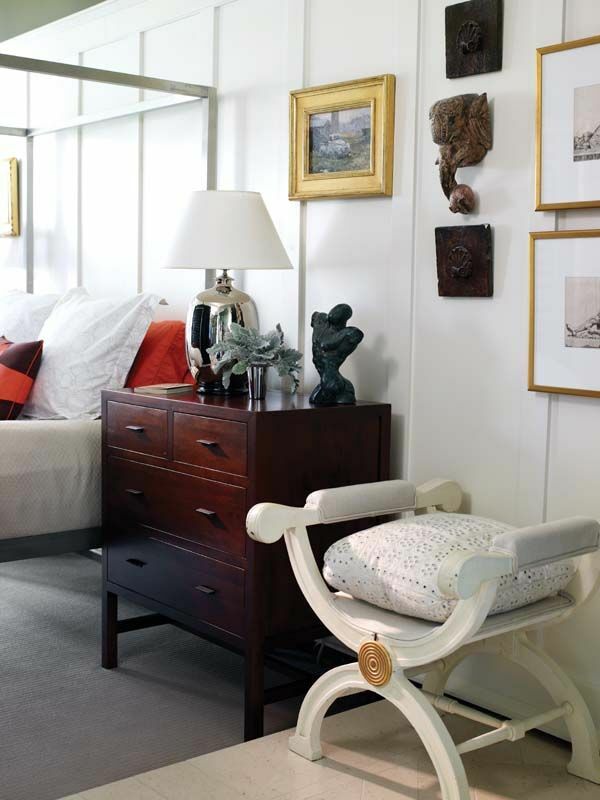 In fact go here to see another fabulous spread that Julie posted from New England Home Magazine. 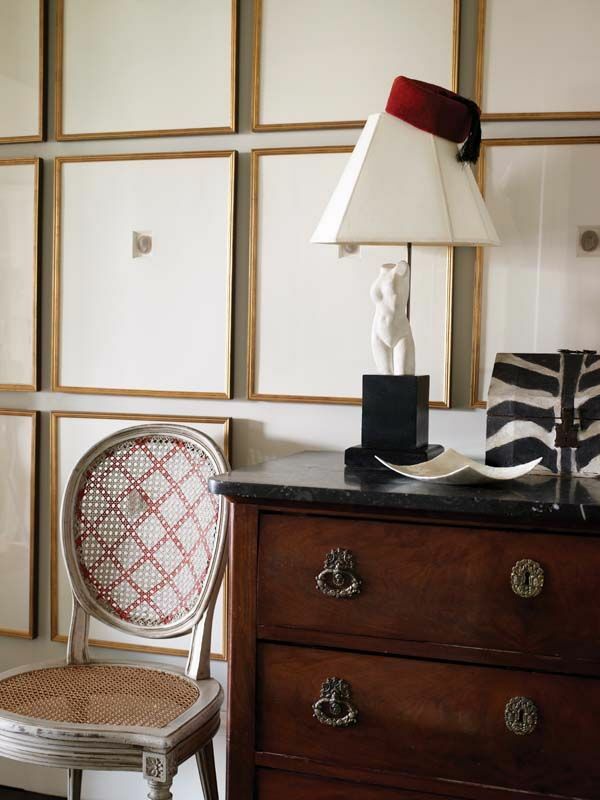 The black and white slipper chairs are to die for! 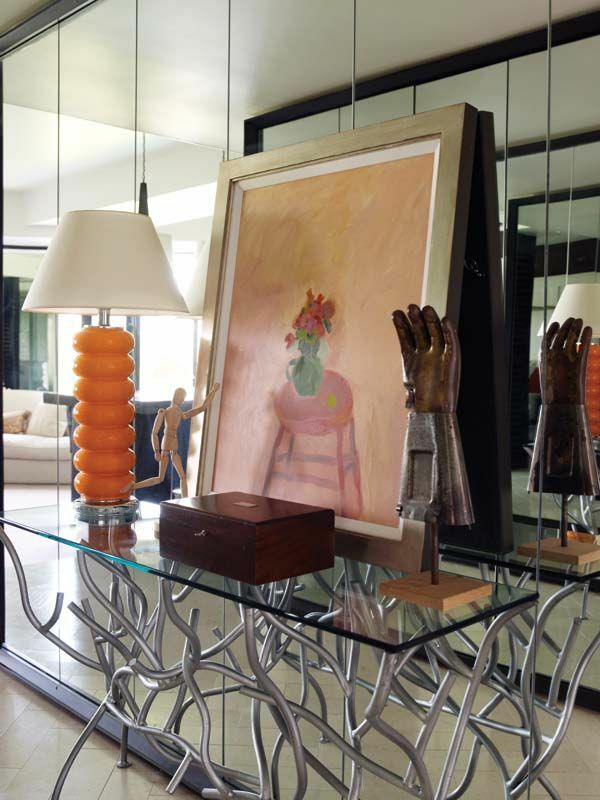 I also really love the collection of art in this home- especially the piece above the console-- gorgeous use of color! That black and white office is AMAZING! Have a lovely weekend! Oh my that patterened cane chair and pink painting, so delightful! Fun, cool, interesting designs with lots of new elements. Umbrella in a room? Had not thought of that before..
i die for that umbrella lighting thing over her banquette. do you think it is rigged to actually light or just for whimsys sake? also in that same shot love the fez on the bust. At least one lamp in every home should be adorned with a Fez. Thanks so much for stopping by La Lamp Shade! I love how they've used artwork like wallpaper in the second photo. I have dreams of doing this in a future house someday. it's all beautiful! I especially love some of the quirky details. That umbrella lamp in the eating nook makes my day. Aaah...I love an inspiring photo. Thank you. I just discovered your blog via LIve Like You's stylish blogger award, and I love it. I'll be back! Thank you for the introduction -- I'm smitten. Their work feels very European. wonder why i never heard of this duo, thanks for the intro. ohhhh, that first image is startlingly gorgeous! 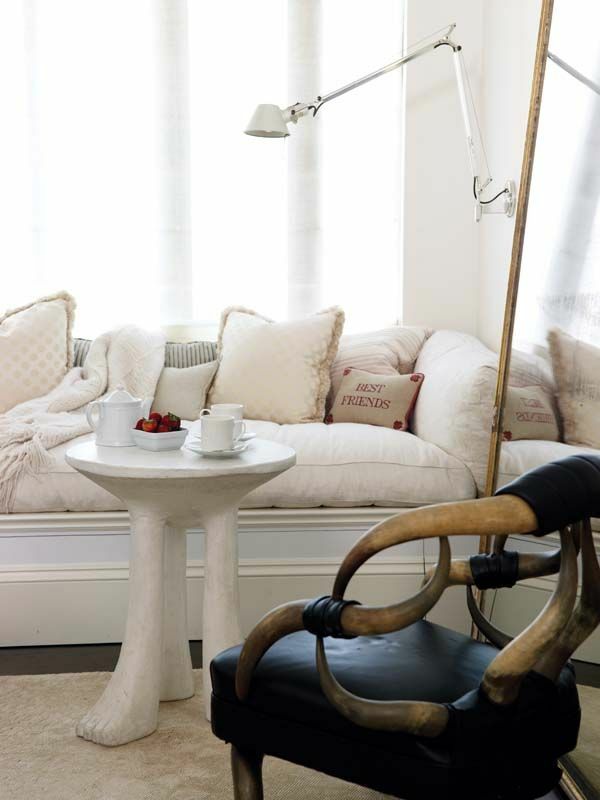 I just LOVE New England Home, its one of my favorite magazines out there. Maybe its because its all about my home. Can I just tell you that your comment today made my week, you are BEYOND sweet and yes even though we dont know each other in real life I feel like we do! The blogging world is just the best! All rooms are so interesting, love all of the fun pieces and decorations! You are right these designers can definitely make it work, in a very creative way. I am re-decorating my master bedroom, these ideas are great for inspiration, thanks for sharing. Now if I can only get a good deal on wholesale flooring, I will be all set ;) Hope you have a wonderful week! The black and white room is adorable. 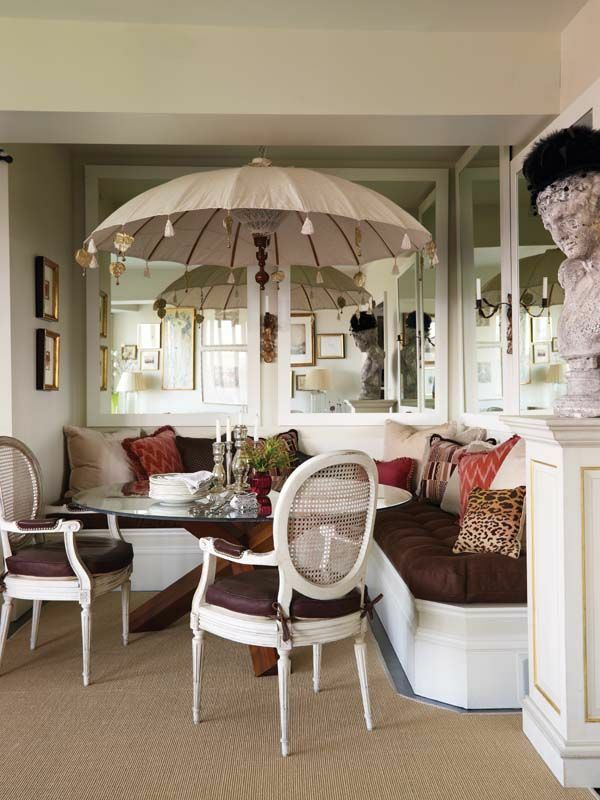 And i love the idea of having umbrella hanging on the ceiling. Cute. I'm loving the black and white chairs. Seriously awesome. I love everything they do! They are an amazing design duo...probably one of the best in the country!